That looks like a chive blossom. I remember being suprised once when a friend of mine put chive blossoms in her soybean salad. It was all delicious and beautiful to look at. I would never have thought of putting the flowers in the salad. Kay — they are Chive Blossoms and I have had them in salad, too. They are tasty. I thought you were on hiatus. Doug — you see much writing in this post? And how late am I answering the comments? And how many posts did I put up today? Not quite yet. 🙂 I like the focus on this photo. 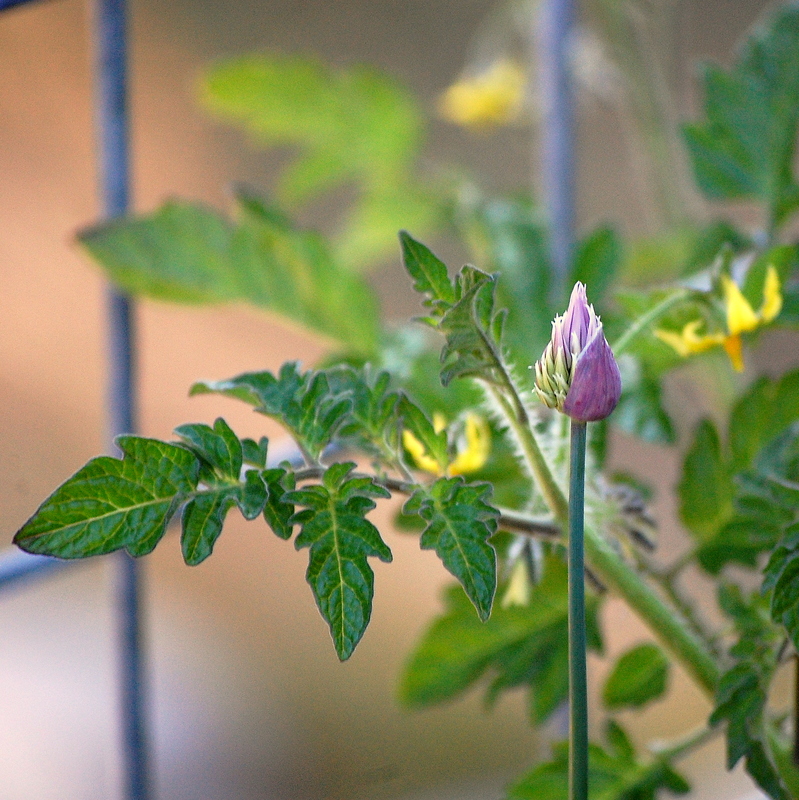 Barbara — no tomato blossom and chive flower sandwiches for you? Marvelous photo and I’m ready for a sandwich — I ate too early this evening!!! Have a great week, Quilly! Sylvia — at this stage, I think a salad made from the veggies in this pic would lack substance. Unique that they are together like this. Carletta – -that’s where they sit on my porch. Lovely composition and colors in this photo. Yum, I’ll have a sandwich Quilly. Teresa — feel free to come make one. I am so done with waiting on people. Nicole — oh. My mistake. I don’t usually do healthy …. Melli — see my comment to Teresa! I was thinking that looked like a chive too – I used to have them growing in a pot but alas, we killed those too. Robin — it is a Chive. You guys are just to with it for me! Betty — it is a flower from the onion family — a chive. Imaginative as always 🙂 Nice shot, Q! Jenn — glad you liked it! Karen — my sister agrees that tomato and onion sandwiches are a no go. Something is eating my patio tomato plant. Not sure what. I just sprayed it with Seven. Hope that works cause my mouth is watering for some fresh garden tomatoes! CL — something is eating my green bean leaves! Way too pretty to eat. Looking good! I miss having a big vegetable garden — maybe next year.